You can use the QuickBooks Online (QBO) Check window to write a check to pay a bill you previously entered — something that you cannot do in the QuickBooks desktop product. Don’t use the Check transaction if you’re planning on paying several bills. 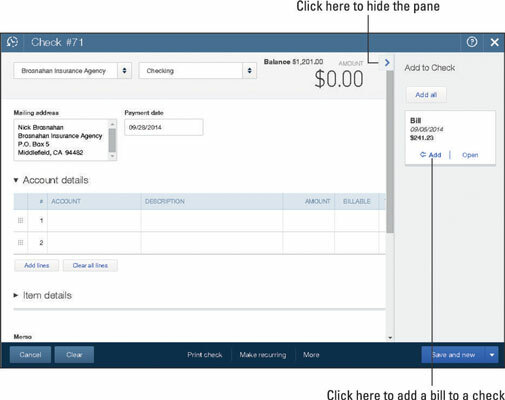 If you select a payee for whom an outstanding bill exists, QBO displays a pane at the right side of the Check window that shows transactions linked to the selected payee; each transaction appears as a separate entry. If nothing in the pane applies to your transaction, you can hide the pane by clicking the button shown. If you’re writing the check to pay a bill that appears in the pane, click Add in the entry of the bill you want to pay. That way, QBO appropriately applies the check you’re writing to the outstanding bill and correctly reduces your outstanding obligations. If you write a check to pay a bill and you don’t apply the check to the bill, your reports show that you continue to owe the bill amount to the payee, which really messes things up. When you click Add, QBO adds that bill to the check and displays the Bill Payment window rather than the Check window, essentially converting the check to a bill payment transaction. 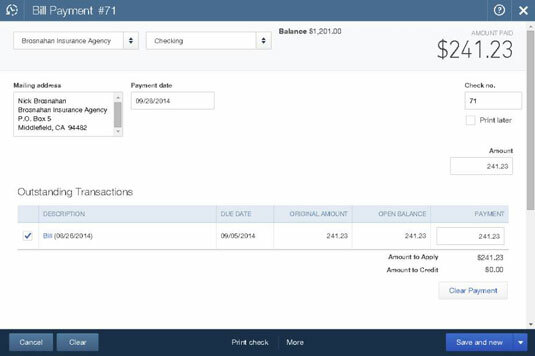 In the figure, you see the Bill Payment window after an outstanding bill is added to a check in the Check window. If you compare the two figures, you’ll notice that the original check number was 71, and it’s still 71 in the Bill Payment window. You complete the Bill Payment transaction the same way you complete a Check transaction. If you add the wrong bill to a check, you can cancel the Bill Payment transaction without saving it.